Last week, we invited Fine Ale Club members to an evening with our head brewer, John Keeling. Held at The Distillers, Hammersmith, the evening featured a wide range of our beers, including this year's Vintage Ale run. 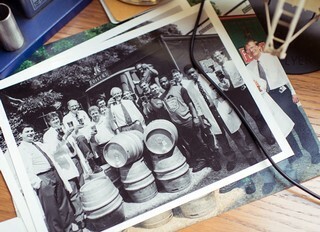 John began the evening with a history of the Griffin Brewery here in Chiswick, which dates back to over 350 years ago. The audience were then walked through the beginnings of Fuller, Smith and Turner and how we became the family-run business we are today. There was the opportunity to taste a number of Fuller's beers, including the latest addition to our core range Oliver's Island, Vintage Ale 2015 and our 1966 Past Masters. Food was served to compliment the beer, with Frontier battered Fish and Chips proving particularly popular!